Not strange, but schlock. Self-expression trumps basic theology, a theology common to both Orthodox and Roman Catholics. "The pine tree is the way, the truth and the life" is what this painting is saying. How do you know it's a painting and not an icon? I don't know icon-stuff and am wondering. Not every religious work painted in the distinctive abstracted styles associated with iconography is an icon. The "Schlock Icons" thread is full of "icons" which are anything but. Oh, OK, I suppose I will schlep over to the Schlock Icon thread, but probably not. Thanks? This place is strange enough! I recommend you do check out that thread, it's quite informative. You're also welcome to email me, my address is in my profile. This one is rather not so strange, however I've never seen Christ-Lamb surrounded by Holy Fathers in a fresco. It's reasonably common, usually painted painted in the apse below the icon of the Mother of God above the altar. This is quite common, and indeed represents the Great Entrance. It represents the heavenly Liturgy, where the angels ceaselessly praise and serve God. 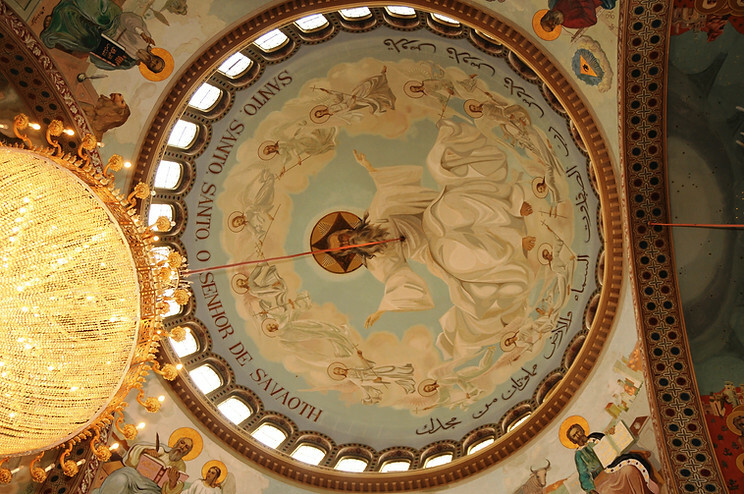 A very appropriate place to paint it is in the lower part of the central dome, facing the altar. However, this version shows one of the angels vested as a priest, which is problematic. 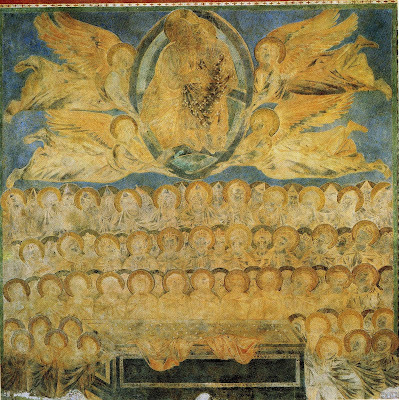 The conventional versions show the angels, some or all vested as deacons, in procession, without Christ present. When this is painted in the dome facing the altar, it beautifully expresses the presence of the angels who invisibly serve at the earthly liturgy, facing the altar representing the heavenly throne and the presence of God. I always get a kick out of what is considered strange and what is not-so-strange. A woman and her child holding a miniature tree with a bunch of similar trees behind them is strange. 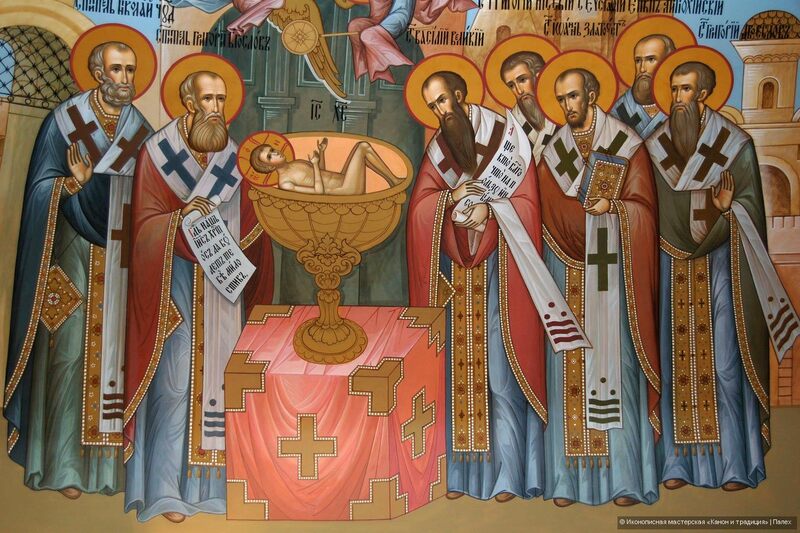 A baby in a large goblet surrounded by old men ready to sacrifice him is not-so-strange. More like a large toddler. That chalice is bigger than an MP chalice. The motif of the infant Christ in a chalice is iconographic imagery which is acceptable. The Virgin and Child pointing to the pine tree of salvation is clearly not. The motif of the infant Christ in a chalice is iconographic imagery which is acceptable. For starters, have a look at the priestly prayers during the Divine Liturgy. What do the priestly prayers say? Here's a link to the text of the DL, which includes the prayers. "Christ-Lamb" - I've seen a lot of such icons, that's the reason is not "so strange" for me. But I put this version here, as Christ-Lamb surronded in the way you perfectly described, is strange. 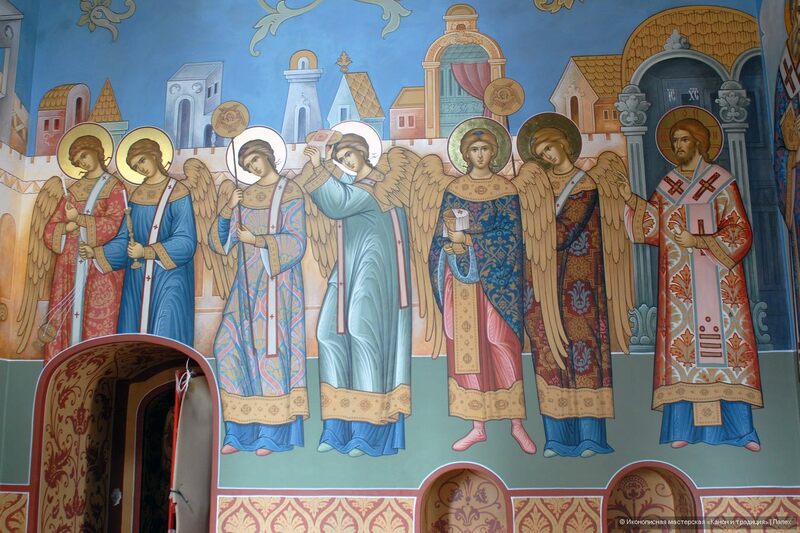 It shows the Mother of God as patron of church choirs and directors, with Sts John of Damascus and Romanus the Melodist standing on either side of her. Rather appropriate for these two saints to be there, as both wrote many hymns dedicated to the Mother of God, as well as her playing a very significant part in their lives. I first saw this icon several years ago, and I rather liked it. ^^Ah, an icon that LBK hasn't disapproved! Oh, I've spoken well about quite a few on this thread. This one was posted some time ago, either in this thread, or in the Schlock Icons thread. I'll see if I can find the posts. And the Protection of the Mother of God shares a Feast Day with the Venerable Romanus the Melodist. Here are the posts. Liza had posted the same or a very similar image, but it no longer shows up in her post. It is SO intimate, I can barely look........if I were to see the original, I'd probably squirt out of my eyes. What a tender and comforting Icon! 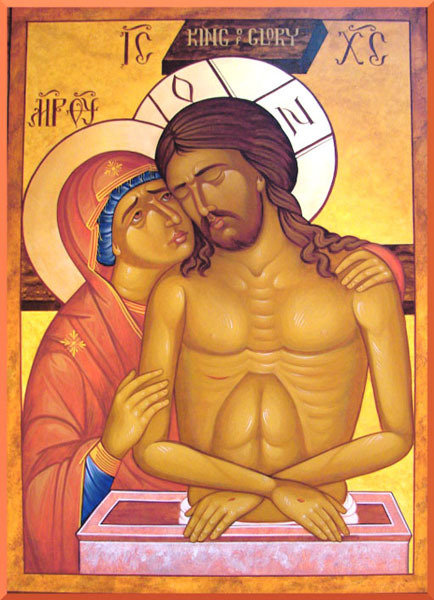 The icon of the Dormition is much better when it comes to the love the Son has for his mother. This motif in the Dormition icon is also completely theologically and doctrinally correct, unlike the image above. I know I understand dimly, but how may one misunderstand what one sees? I don't see tenderness, intimacy, comfort, human-ness? This is the central dome of the Metropolitan Orthodox Cathedral, in São Paulo, the largest Orthodox church in Latin America. An amazing church, but isn't this portrayal of the Father Unorthodox? There is no prohibition on the Ancient of Days. The only problem with this one is the lack of the identifying IC XC. The triangular halo denotes God the Father though, doesn't it? The lack of the identifying IC XC and the eight pointed slava instead of a cruciform halo, implies this is a Lord Sabaoth, not Ancient of Days. In fact, the inscription seems to translate to "Holy, holy, holy, O Lord Sabaoth." 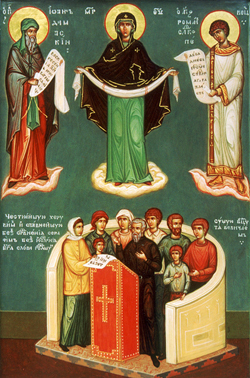 Depictions identified as Lord Sabaoth always are (erroneous) depictions of the Father, like in the Paternity 'icon' below. Icons of God the Father as the Ancient of Days are quite common. Their legitimacy is a matter of dispute. St. Nicodemus the Hagiorite, in The Rudder, comments on the canons of the 7th ecumenical council and says that icons of the Father as Ancient of Days are acceptable. Lord Sabaoth is a title of Christ. And I have seen icons that incorporate the eight point slava and the cross. Which leads one to wonder, if depictions of the Father are forbidden, who is the eight point slava for? Which leads one to wonder, if depictions of the Father are forbidden, who is the eight point slava for? Still a big if, in my opinion. One can just as easily see a man with his wife, much like the icon of Ss. Joachim and Anna. I don't think that an appropriate way to picture our Lord with his Mother. But couldn't the same be said for this? Lord Sabaoth is indeed a title of Christ, it just doesn't have a use in iconography. I have only see it used as a title for God the Father in uncanonical images. The eight point slava has no place in iconography either. It is a foreign as the figure it crowns. That there are no canonical icons that use the eight point slava or use Lord Sabaoth as a title. Forgive me, but your profile says you are considering conversion to Orthodoxy and you describe yourself as an inquirer. Where did you pick up such certainty about what is and is not canonical iconography? I'm by no means an authority, but in my experience, and according to what I've read, my statement is correct. I've never seen either the title or slava unless it was on an icon identified as uncanonical. So then, it is not necessary to interpret Daniel’s vision as two distinct Persons: the Father and the Son. It is completely consistent with our theological principles and dream language, to see that two aspects of the same person are “dramatically” represented. This interpretation also avoids a gross violation of the accepted rule that the Son reveals himself in the Old Testament. There is no other passage in the Old Testament in which it is said, by the Orthodox, that the Father became visible. And we know also that no other Biblical passage is sited by those who want to see the Ancient of Days as the Father to justify direct images of the Trinity. Where else in Scripture has that ever been the case? It sounds completely ad hoc. Yes, dreams do not always accord to human logic, but this dream is meant to be interpreted and as such the imagery needs to be consistent. Also, who's "accepted rule" is this going by? Confession as we know it didn't exist for the first few centuries, not did the iconostasis, Znameny chant, the spoon, the forms of many icons, etc. Yes, these things reflect Scriptural truths, but they didn't always exist in that form. NT Trinity icons have been around since the Middle Ages and have enjoyed the acceptance of countless faithful (including St. Nicodemus the Hagiorite) up to this day. How ancient does something have to be and how long does it have to last to become a tradition? I do agree that the Ancient of Days being the Father would appear to challenge the "formerly unrevealed" argument for icons, but it's better to wrestle with that on it's own terms than use arguments on Daniel and on tradition that are weak in other ways. Why would the same be said for this? This isn't a common position for a man and his wife. How much and what have you read? How much experience do you have, and how much and what have you read that you can be so certain in your correctness? I've never seen either the title or slava unless it was on an icon identified as uncanonical. Unless you're someone like Jaroslav Pelikan, who wrote whole scholarly works on the Eastern Christian tradition long before he was chrismated, you probably haven't read or experienced much if you're merely inquiring into Orthodoxy. Maybe, then, you should tone down the certitude on things you're still (supposedly) learning. Considering the Theotokos is Christ's daughter, mother, and bride, I'm not sure this is a sound objection. My experience is confessedly very little, but I have read a fair bit. At the very least, enough to support my claim. I am still learning, and I don't know everything, but that doesn't mean I don't know anything. Here are some links to some of the things I've read that have lead to my conclusion. 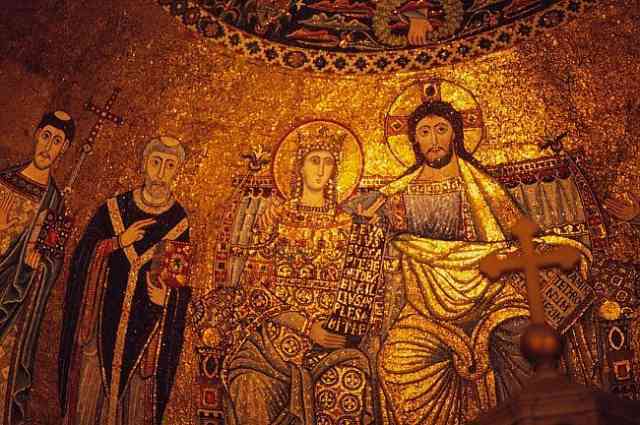 Is there an icon of the Sign where Christ is bearing Mary in His womb? Even this is problematic when you understand the weird bridegroom theology that came about heavily post-Schism. For an academic RC perspective (which reveals how weird the beliefs associated with such theology, not to mention how such imagery pops up), "The Art of Theology: Mary as Bride of Christ" by Mary Barker and Mervyn Duffy, Compass, A Review of Topical Theology, Autumn 2014 issue, Vol. 48, No. 1. If Christ holding His Mother's soul while looking on His Mother's body is not enough love and tenderness, I'm not sure what you're looking for. When I'm telling you what I think, do I really care how sound you think my objection? It's my objection, for cryin' out loud. My experience is confessedly very little, but I have read a fair bit. At the very least, enough to support my claim. I am still learning, and I don't know everything, but that doesn't mean I don't know anything. Nobody said that you don't know anything. We only said or implied that you speak with a great certitude unbecoming an inquirer. One probably shouldn't be so quick to draw conclusions when one's primary task is to learn. Here are some links to some of the things I've read that have lead to my conclusion. The problem with inexperience is that one doesn't know what to read.